Go Foxburg Sweepstakes winner announced - Go Foxburg! How would you feel if you find yourself with an opportunity, almost out of the blue, to explore a popular tourist destination to which you have never been? Elated, grateful, curious? That’s how the winner of the Go Foxburg Sweepstakes felt when she learnt about her winning the Go Foxburg sweepstakes. Congratulations to Heather Shelkey of Bruin for winning the recently concluded sweepstakes held by Go Foxburg! The sweepstakes was held on Go Foxburg’s facebook page and upon its conclusion the winner was electronically drawn. The sweepstakes, sponsored by Foxburg area businesses including Foxburg Pizza and Country Store, Foxburg Wine Cellars, Foxburg Inn Hotel, The Allegheny Grille, Hi-Level Golf Course (Kossuth, PA), Allegheny RiverStone Center for the Arts, and Divani Chocolatier & Barista, was one of the first of its kind initiated to encourage participation on GoFoxburg.com and its facebook page within the local community. Over the last year GoFoxburg.com has rapidly emerged as an Internet marketing platform keeping people up to date about the events and activities in Foxburg and surrounding areas. Visitors, whether local or from out-of-town, benefit by having a collective source of information and updates about things to do in our area. GoFoxburg.com serves as a compliment to other tourist information websites by providing visitors with pertinent information that is specific to our area. 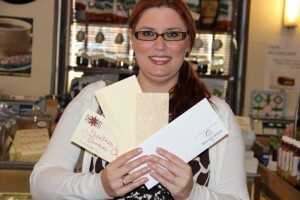 Heather won almost $400 worth of gift certificates that she says she’ll use for a mini vacation with her hubby. She was delighted to come to Foxburg and discover all there is on the offer. “I’ve passed through here many times but never stopped by to see what Foxburg was all about!”, said Heather excitingly when she came to pick up her prize at Divani Chocolatier & Barista, home of Go Foxburg Marketing. What’s really amazing is that Heather lives only about 15 minutes away from Foxburg. This does make one wonder how many local folks are missing out on all the wonderful activities that go on in the area right under their noses. Foxburg area businesses hold regular meetings and work hard to bring newer things to do within the community. The past couple years have seen several new events and more are being planned for future. To stay up to date about business events and specials, visit www.GoFoxburg.com/events-calendar or ‘like’ us at www.facebook.com/GoFoxburg. To list your events, send an email with all the details and a photograph to events@GoFoxburg.com. To be listed as a business or artisan or for any other inquiries send an email to info@GoFoxburg.com.